Every year, 23,000 Americans die and 2 million get sick because of antibiotic resistant bacteria.1 Our antibiotics are loosing their effectiveness in part because of overuse and misuse in livestock farming. I’d like to explain to you why that is and what we can do about it. How much antibiotics are given to livestock? The FDA only monitors the quantity and types of antibiotics sold for use in livestock. They do not collect data on why the livestock are given the antibiotics or even which species are administered the antibiotics. Therefore, it is hard to know exactly which animals are being fed antibiotics and why they are given them. 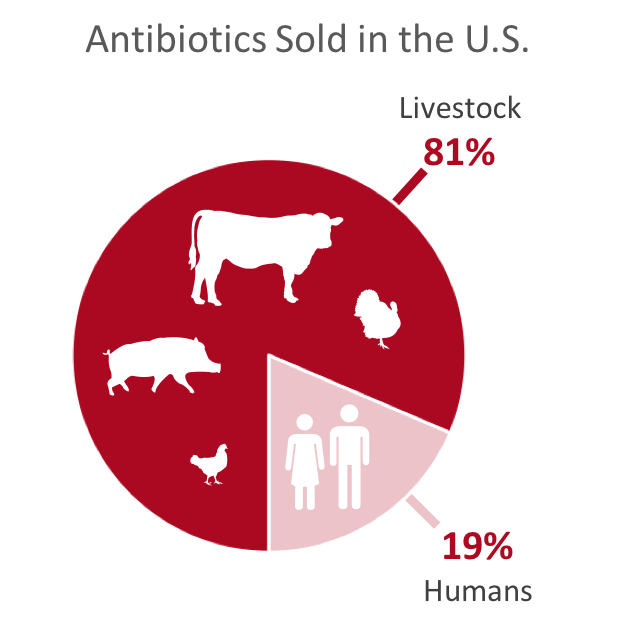 More than half of the antibiotics given to animals are the same or similar to those used in human medicine. In 2015, 62% (or 21.3 million pounds) of the antibiotics given to animals were considered “medically important” by the FDA.3 The FDA defines medically important antimicrobial drugs as “antimicrobial drugs that are important for therapeutic use in humans.”6 However, unlike when we are prescribed antibiotics to treat an illness or an infection, livestock are rarely given antibiotics under the direction of a veterinarian. In fact, 97% of the antibiotics dispensed in 2015 were dispensed to farmers over the counter.3 Whereas humans need prescriptions for antibiotics, farmers buy them the same way we buy Tylenol or Advil. Antimicrobials are administered to healthy livestock if they are at risk of infection or illness. For example, if some animals at a farm are sick, antibiotics can be given to healthy animals to prevent disease transmission. 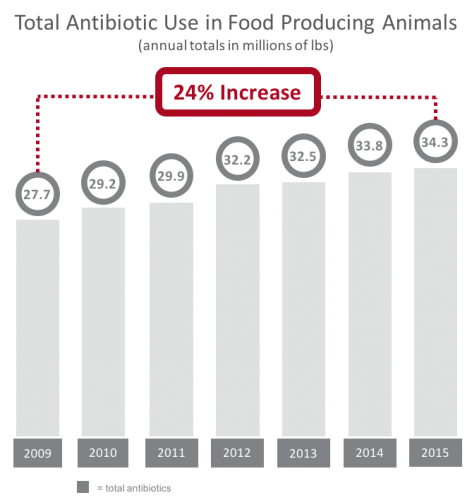 It is hard to know just how much of the 34.3 million pounds of antibiotics sold for livestock in 2015 were for treatment of infections and disease and how much were for preventative or growth promoting purposes. There is no nationally representative data for antibiotic use, specific drug information, dosages or duration in food producing animals. As noted above, the FDA does not collect it. Although we don’t know why animals are given antibiotics, we can presume the reason based on how they are delivered. 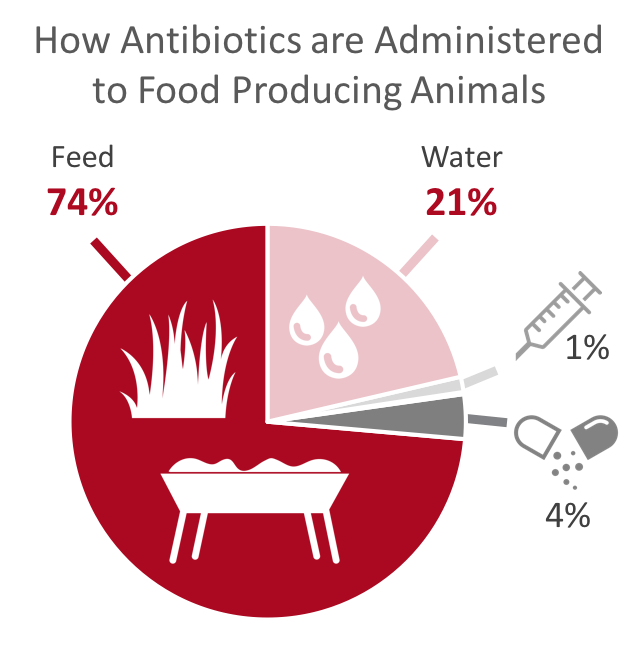 According to the FDA, 95% of all antimicrobials administered to livestock in 2015 were delivered through their feed or water.3 Only 5% of all antimicrobials administered were through therapeutic methods, such as oral, topical or injection. It stands to reason that the 95% of antibiotics given to animals in their food and water are not for treating sick animals or for controlling disease. If they were, the antibiotics would be delivered in a method consistent with therapeutic treatment. What does growing antibiotic resistance in human medicine have to do with treating animals with antibiotics? A lot. 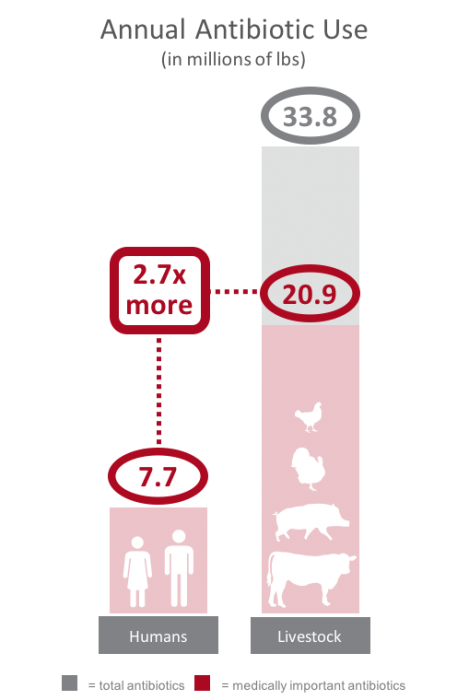 According to the U.S. National Academy of Medicine, “there is a direct link between antibiotic use on farms and the spread of antibiotic resistant bacteria to human populations.”2 Nontherapeuctic use (for growth or to prevent disease) of antibiotics has been shown to create antibiotic resistant bacteria.8 Resistant bacteria develop in livestock and can be transferred to people two ways: either through coming in contact with the animals directly on the farm, or by handling or consuming meat contaminated with resistant bacteria.14 These resistant bacteria can also spread into the environment from animal waste, causing contamination of fruits and vegetables. Antibiotic resistant bacteria make us sick. The CDC conservatively estimates 2 million illnesses and 23,000 deaths are the result of antibiotic resistance each year in the United States.1 It would be a mistake to think we can solve the growing crisis of antibiotic resistance by focusing only on the antibiotics used in human medicine, especially since they only account for 20% of the antibiotics sold today in the United States. More than 400,000 Americans get sick each year by consuming food containing drug resistant bacteria.15 And children younger than 5 years old have the highest incidence rate for infections from consuming these contaminated foods.8 This is because animals raised with antibiotics will naturally develop resistance, encoraging growth of resistant bacteria. These resistant bacteria are often transferred from the animal to their processed meat. For antibiotics to stay effective, we all have to use them properly. Both in human medicine and in how we raise livestock. We should not tolerate the misuse or abuse of antibiotics in livestock farming. The societal consequences are simply not worth it. 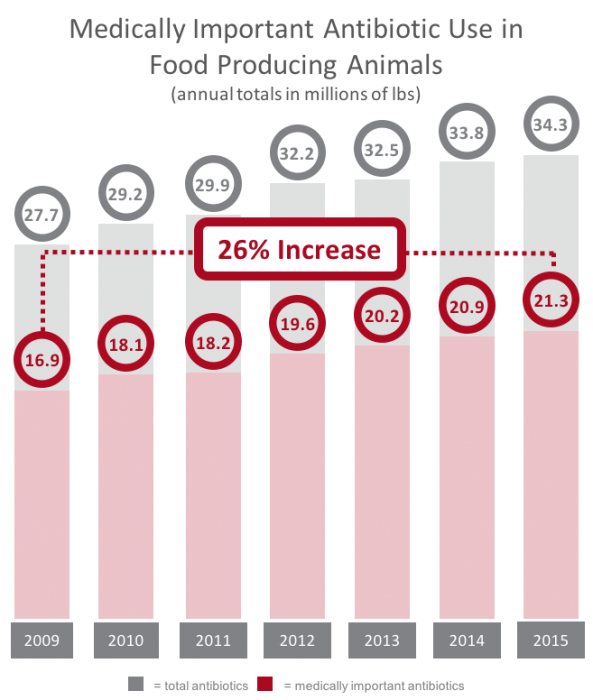 The United States is beginning to implement policies on the use of antibiotics in food animal farming. Earlier this year, the FDA completed the implementation of Guidance for Industry #213.16 This guidance requires veterinary oversight for medically important antibiotics and eliminates the use of these antibiotics to promote livestock growth. However, it should be noted that following GFI #213 is voluntary and does not address the use of medically important antibiotics disease prevention. It will take a few years to see if this new guidance decreases the use of antibiotics in raising livestock. Until then, there are a few things that we can do. How can you make sure you are buying meat that was raised without antibiotics? The USDA has stringent labeling requirements for meat and poultry. The claims “no antibiotics added” and “raised without antibiotics” can be used if sufficient documentation is provided to the USDA demonstrating that the animals were raised without antibiotics.17,18 Claims on food packaging, however, can sometimes be confusing. Watch out for claims like “does not contain antibiotic residues”.19 This is not an allowed claim because it is impossible to prove (more on meat related claims in a future post). There are a few grocery store chains to that are committed to selling meat raised entirely without antibiotics. Whole Foods has a policy of “no antibiotics, ever.”20 Costco is in the process of phasing out selling chicken raised with medically important antibiotics.21 If you are unclear about whether meat raised without antibiotics is available where you shop, ask your grocer about how the animals were raised.